For Sophie, the feeling of her dreams and reality coalescing feels so good it hurts. And for Tucker? Well, he just wants to keep pushing and see how far they can take it. On June 8th, I walked into The Lyric Theater in Los Angeles. Sophie and Tucker were finishing up their soundcheck. It was a few hours before a sold-out show filled with fans, friends, and industry insiders. But the duo takes all that in stride. 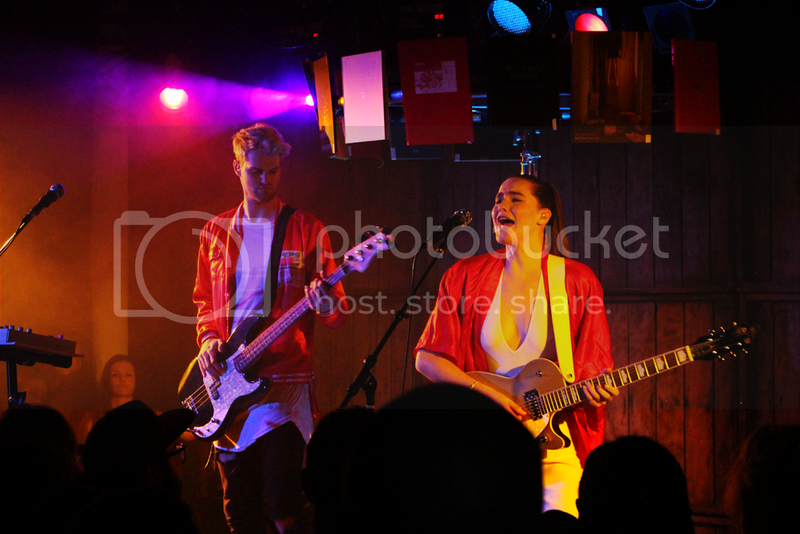 Over the past few months, SOFI TUKKER have been garnering more and more attention. For Sophie, the feeling of her dreams and reality coalescing feels so good it hurts. And for Tucker? Well, he just wants to keep pushing and see how far they can take it. Sophie is soft spoken but in no way diminutive. Like a finely polished stone. Tucker, while laid-back, is more direct. He is the babbling brook. They complement each other well. We go backstage and settle down on some couches. The back of the Lyric is filled with art from the gallery next door. The browns, deep blues, and greys. A nice peaceful vibe for a little chat before the raucous. Thanks for taking the time to sit down and chat with me a little before the show. So, where did you guys grow up and how did you first start playing together? Sophie: I... don't always know how to answer this question. I have an American passport but I was born in Germany. I grew up in Atlanta, Georgia and British Columbia. And I went to a boarding school in a small town in Philly. And now my family lives in the Netherlands. And I have an infatuation with Brazil (laughs). Tucker: Well, you did live there for a little. And well, my answer is more boring. It's just Boston (laughs). Oh, wow. So how did you two meet and get together to start playing music? S: I was studying International Development. S: (Whispers) The rest is history. And when you solidified as a duo, how did you come up with the name and spelling of your band? S: Honestly? We came up with the name first, 'cause it's obvious. And then we researched the name and it turns out there's a woman named Sophie Tucker. And uh, she's awesome. She's an entertainer from the 1920s. And we thought it was pretty cool to pay homage to her with our name. So we just changed it and made it a little weirder. You both made comments about a fascination with Brazil and some of your lyrics are in Portuguese. Is that some sort of homage? S: Yeah, some of the lyrics in our sings are actually poems by a Brazilian poet named Chacal. And I met him at Brown. He was doing a poetry workshop and I was working with him in another context. And we still have a really good relationship and he lets us use his work. Obviously, he gets publishing. But it's really great. It's cool. Well, that's awesome. So, when it comes to writing your songs, does one of you focus more on lyrics and melody and the other on composition? Or is it more of a full collaborative effort? S: We write our best work when it's all together in the same room, putting everything together until it gets to the point when you can't really tell who's doing what. And then we have conversations afterwards, 'Who made that bass line?' Like, we really don't know (laughs). The lyrics... I mean, I love writing lyrics, but I always get his opinion. I guess that's sort of my territory where as he has his territory. But I think the more it's blurred, the better it is. And who would you say are some of your influences, presently and when growing up? S: (chuckles) I can say so many different things. Yeah, I have a lot of really old-school influences. I just went to this concert of my two favorite Brazilian artists who are absolute revolutionaries. T: That means nothing to me. (We all laugh). S: Yeah, I went to the concert by myself. T: We were in Miami and we were doing work there and it happened to be the night they were there. And it was the first time in like, three years, and she was like, (gasps). And I was like, 'I'll be at the beach (laughs). S: It was so good. But, you know, I grew up listening to Buena Vista Social Club and Gypsy Kings. Also, a lot of jazz. I used to sing and write jazz. And, I like to always shout-out Feist, too because she's just one of those artists who when I saw, I went, 'Damn, I want to be doing that.' It was extremely inspiring for me to go see her play. And I think her lyricism is brilliant. S: And then on my side I got Kundalini Yoga chanting. Which you may not be very familiar with (laughs). T: Which, again, means nothing to me (laughs). T: And that's kind of like House music or Techno, you just get lost in the vibe. It's really cool because the first couple songs we ever made was Sophie chanting, talking, and not really singing. And then we put out a song with her singing and people were like, 'Whoa, she can sing!' So, it's fun, we have fun with it. Nice, nice. So, when performing live, it's a different vibe than a standard rock band set up. What do you like to bring to your live performances to give you that edge? T: This was a conversation that was hard, at first. We were making music to make what we wanted to hear, not necessarily performing it. And then, when we started to have the opportunities to perform it, we were going back and forth with how much we should do live and how little we should do live. Because the first time we ever performed, I was like triggering every instrument when it was coming in and she was playing... well, she still plays all the guitar, actually (chuckles). But, it still seemed like too much. And I was like, in the gear and couldn't even look at the people. And I was like, 'Do they like that? I don't even know what the vibe is like in there.' As a DJ from before, I was sort of like, feeding the crowd and feeling off the crowd. Interacting is one of the most special things at a concert that happens and I couldn't do that when just the two of us were trying to do so much. So then we sort of scaled it back. 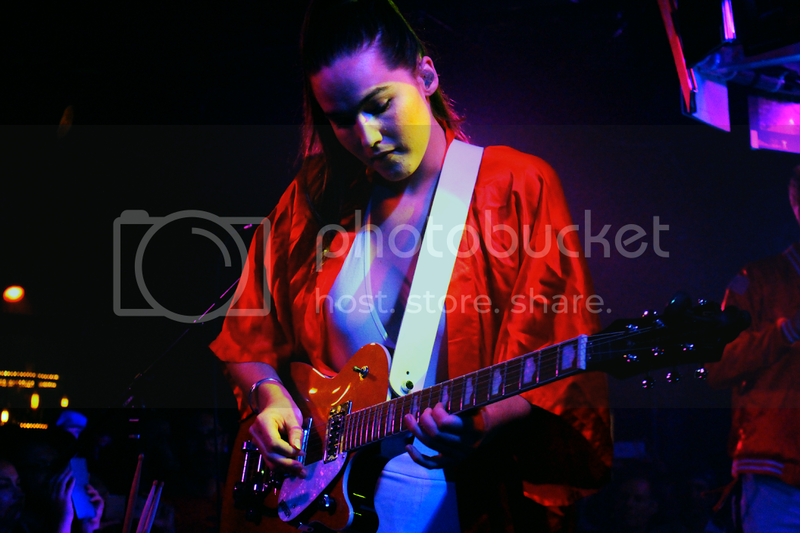 And like Sophie said the other day, embodying the music instead of trying to be a full band with just two people because obviously that's just not possible. And it's not the point of our music. T: Because we choreograph things and make it quirky and stuff. We try to entertain and do what is so fun for us. And I think it ends up being a lot of fun for other people, too. S: We're both really physical people, too. We're both athletes and incorporate into the music in quirky ways. T: I should mention the books. So, instead of drum pads, we made a drum pad set up with a sort of "book tree" set up as we call it. We cut out the inside pages of the books and stuck in contact microphones and wired them to the computer so on every song they play different samples and different parts. So, I can actually play a horn part, or something. So, my practicing is making sure I hit the right book at the right time. And then I get to be tall and big instead of hunched over and not looking at everyone. And I face Sophie a lot so we can interact. It's just, when it's a really good vibe, we're all feeding off each other and it's more of a mutual thing. After we speak, Sophie and Tucker take some time to themselves. Sophie does yoga and meditates. Tucker stretches out on a couch and looks up the score of the NBA finals game. But, before long, the venue is filled and riled with anticipation. And SOFI TUKKER delivers. That book tree? Blew everyone's mind. It's that kind of mix of technical and artistic know-how that took their show to another level. They utilized coordinating outfits, choreography, audience participation, the whole gambit to create a fully immersive musical experience. The precision of their instrumental skills (Sophie on the guitar, Tucker on the drum pads and sampler) combined with the dynamics of their goofy, yet endearing choreography put a smile on every face. This is a band that is a must to see live and experience firsthand. SOFI TUKKER's debut EP, Soft Animals, is out now.